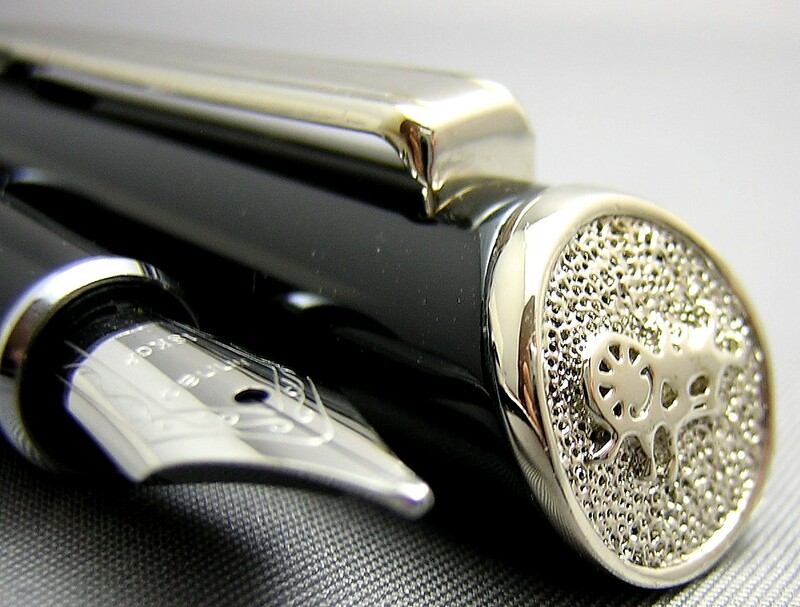 "Hi Norman, Could I just pass on how impressed I am with both the pen I have just received and the quality of the service you provided. The pen looks and writes beautifully. 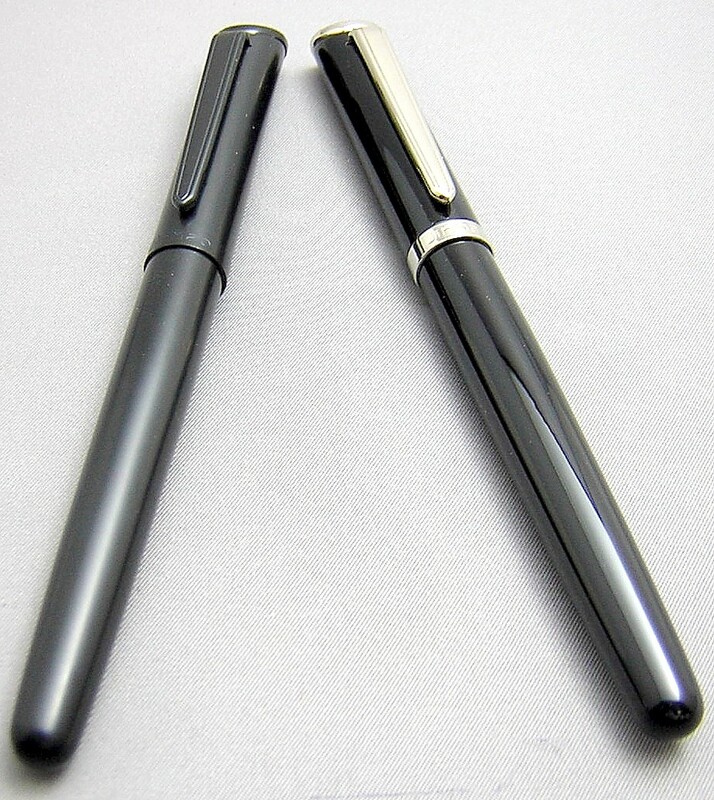 I hadn't been expecting the pen for at least another week (as it was shipping to the UK) and to get it within just a few days of purchasing it was a very pleasant surprise. The handwritten note was also a nice touch, look forward to buying from you again. 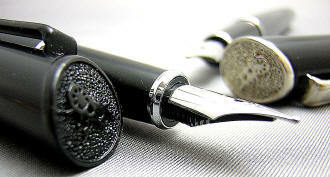 All the best,"
"Norman, I received the Bevel today. I dipped it in some ink (pelican blue) just to test it out, I'm very impressed. This is my first Chinese pen, and it certainly will not be my last! Thanks for the excellent customer service. I love the way you wrote your note, with the wax seal (so cool). And that you wrote the color of the ink at the bottom (great idea!!). We'll be doing business again, I promise!" 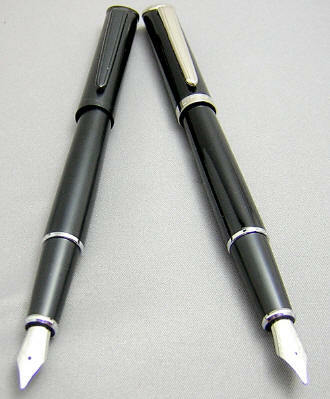 The Bevel is a slim pen, but full-sized in length, measuring 5-1/2" capped, 6" capped and 4-3/4" with cap held aside. It's a spare, clean design with it's most noticeable feature being its beveled cap top. The Chrome version has a chrome clip, cap band and cap top, which all nicely set-off the reflective black lacquer of the cap and barrel. 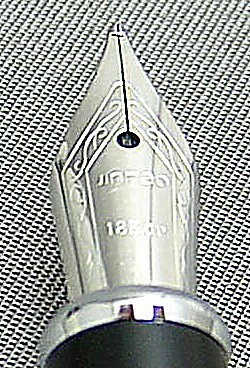 The cap band is engraved with 'Jinhao' and '11' (the model number), but it's the raised Jinhao 'Charioteer' logo (upside down in the image) that adds distinction and set on a 3-dimensional honeycomb background. The Stealth has all of the same design elements, but has more of a matte finish (I suspect it's anodized aluminum, but I can't confirm this), with everything rendered in black. It's perfect if you're an international spy and need to sneak your fountain pen into a den of miscreants. 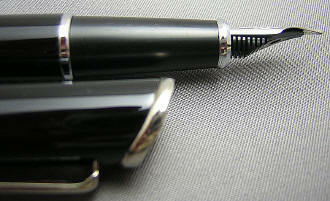 The pen comes with a slip cap, which securely snaps back into place. 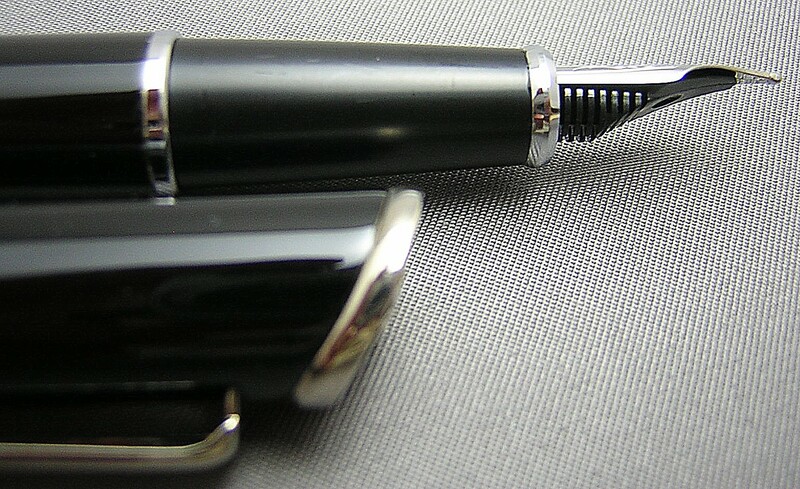 Removing the cap displays the 18K gold-plated, silver-colored steel nib. 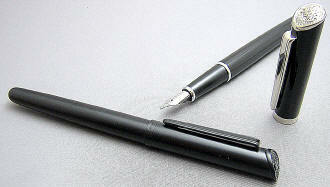 The size of the nib is in keeping with the slim design of the model. I would rate the nib as a light medium, meaning it's between a typical western fine and medium. 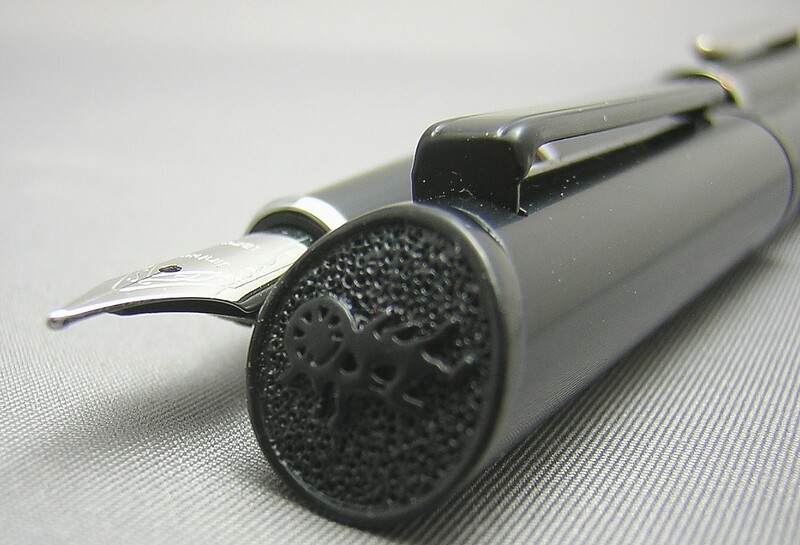 Unscrewing the all-metal fittings between section and barrel reveals the piston converter for bottled ink. 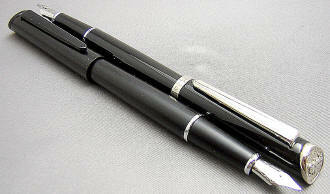 It will also take International-style cartridges, such as those from Private Reserve. As with all new pens, I recommend to run a dilute solution of dishwashing soap (two or three drops to a small bowl of water) through a new pen a few times, followed by water only. Step one is effective at removing manufacturing oils that can tend to make the ink less than enthusiastic in heading from the converter/filler to the nib, and step two removes the traces of the detergent you've used...which tends to have the opposite, diuretic effect.